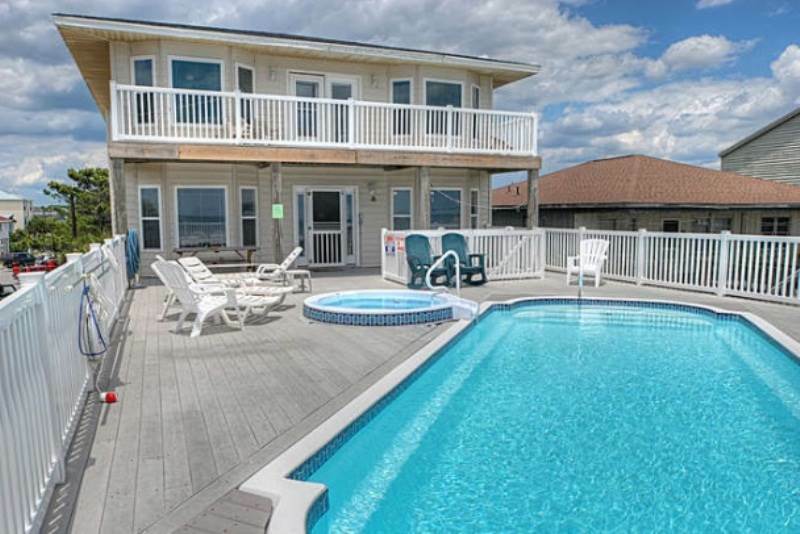 6 bedrooms, 6 bathrooms OCEANFRONT home with a private pool and hot tub to accommodate a large family. Raised pool overlooking the beautiful Atlantic Ocean. Great room is spacious and leads out to a nice covered deck to relax Oceanside. Well-equipped kitchen with additional small refrigerator. Wireless Internet, 1 DVD players and 2 Blu-ray players, new 55" HDTV flat screen in the living room, 42" flat screen television in the upstairs living space, 42" flat screen television in master bedroom and a 36" flat screen television. The smart TV has Hulu and Netflix apps available with your login credentials. Other amenities include central heat and air, washer/dryer, pop up playpen, phone with domestic long distance included. Outside shower (hot and cold), private walkway to the beach, beautiful decking to take in the ocean breezes, propane grill. Accommodates 20. All bed and bath linens provided in the rental. Upstairs OF Master Suite has King and Jacuzzi tub in the master bath; King, 2 Queens, 2 Queens, 2 Queens, 2 Queens. Has a private pool with spill-over non-heated spa (pool & spa can be heated March 15-May 15 and Sept. 15-Nov. 15 for additional $75/day surcharge - must be heated for the duration of your stay). Available for weekly rentals only.